Thank you for visiting orthodoxvestments.com, the online home of Tabitha of Joppa. My name is Emily Sarisky, and I’ve been making fine ecclesiastical Orthodox and Byzantine vestments and linens since 1989. I have always done custom work, which is why I have a wide variety of fabrics and galloons to choose from. I feel this is one important way of making each garment unique. I will work with you to get the look you want and stay within your budget. 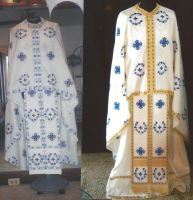 * All Vestments & Church Altar linens are custom-made to your liking. 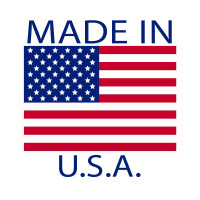 * I use a wide selection of fabrics and galloons from around the world. 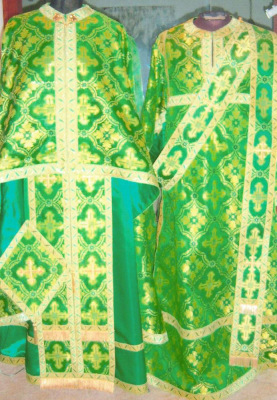 * The embroidered vestment sets are lightweight for hot weather, easy for travel and washable. I will be glad to send you any swatches of fabrics and galloons to help you make your choice, and I’m always happy to provide additional photos of my work, along with references and any other information you may need. The links above will take you to other pages with information on vestments, dalmatics, and embroidered fabrics. Check out my sale items which will be updated with new inventory available to ship immediately. In the Fabric Catalog you will find new vestment fabrics and styles, which will be updated as they become available. 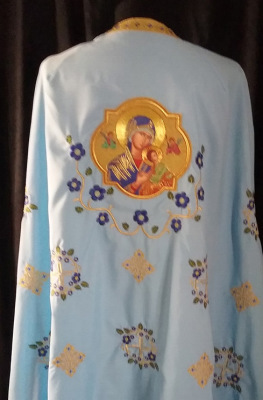 All of my vestments, dalmatics, altar linens & chalice veils are completely customizable. From the color of the fabrics, embroidery selections, galloons, stichars - you choose the combination for the look you want. 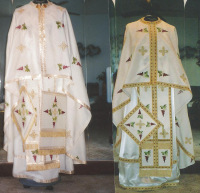 I can create matching Vestment & Dalmatic sets. Already have a full vestment? 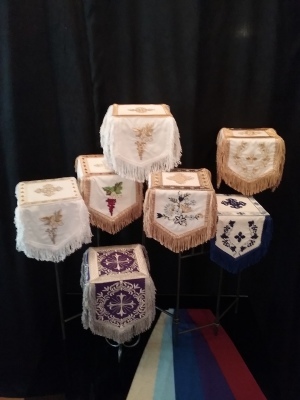 Update your current set with a different colored stichar for different Liturgical seasons. So many combinations are possible as seen in the Chalice Veils - fabrics, embroidery colors, and trim. 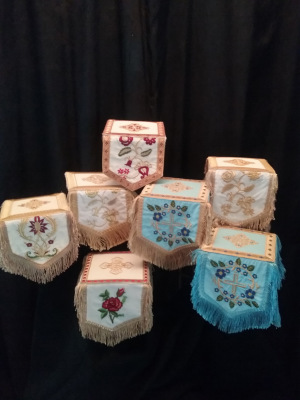 The embroidered patterns shown to the far right can be viewed in the first set of patterns in the Fabric Catalog and are available in burgundy, light blue, yellow, and white. 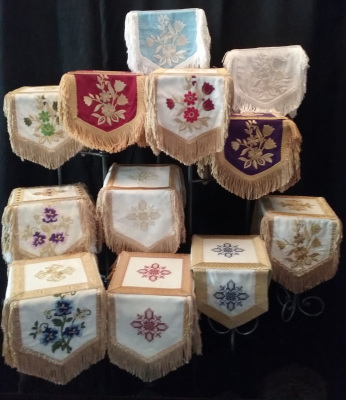 The embroidered patterns shown in the center and far left, can be viewed in the second set of patterns in the Fabric Catalog and are available in burgundy, yellow, light blue, dark blue, purple, and white.